J’s attended 2 of her 3 birthday parties of the weekend, and I hung around Friday’s party long enough that I couldn’t resist taking a couple of pictures to share. 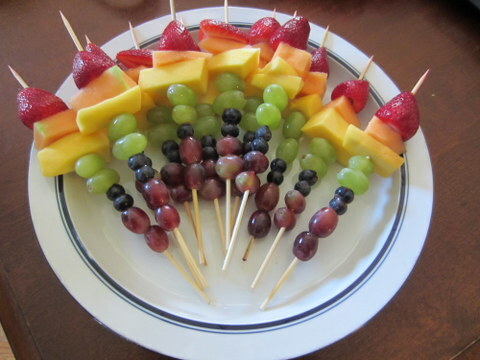 First, rainbow fruit skewers. . . cute, right? Lucky for me, some of the kids were suspicious of the mangoes, which were recruited to represent orange even though the birthday family aren’t mango fans, either. So at party pick-up I proceeded to eat a vast amount of mango. I love me some mango, especially when I don’t have to go to the trouble of cutting it myself! You might remember that for J’s Halloween-themed birthday party, the kids pinned spiders on the web. 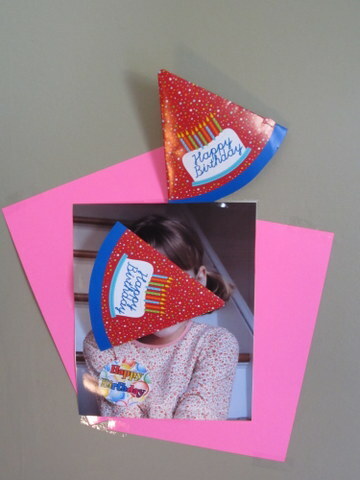 At Friday’s party, the girls pinned the hat on the birthday girl (yes, we pinned a hat poorly in keeping with the no-current-front-portraits tradition). And the Birthday Girl requested the same cupcakes that she wants every year. 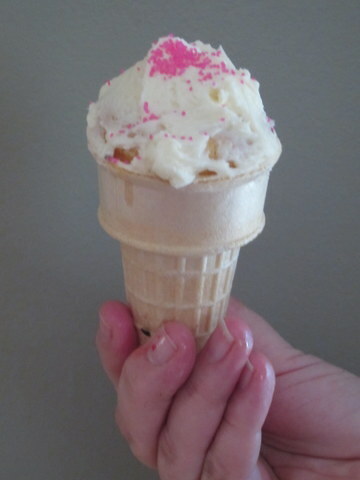 They’re baked in ice cream cones! When I started taking pictures for a post, my friend insisted that I recommend Pinterest for birthday ideas. (Incidentally, I’m “doing” Pinterest, too, although I’ve barely pinned anything yet.) Here’s her board with a couple of items that she pinned. Which reminds me of another great idea that I didn’t get a chance to photograph: pre-scooping ice cream into cupcake holders, then popping them back into the freezer until it’s time to serve the cake. How smart is that, right? What? No mention of the clever, yet freakishly dangerous cupcake cone holder? OMG, I think that I blocked it out due to the trauma. We used an aluminum pan which I cut holes in, but the cut parts of the aluminum was sharp and, well, blade-like. I meant to suggest those cardboard take-out cupholders, but Colleen, that’s a good idea, too. Yes, everyone, I did wound myself. . . .